Thailand’s Paetongkum Lukbaanyai clashed with China’s Luajiah Sathianmuaythai for the special super-welterweight (154lbs) commemorative belt. Muay Thai fighter Paetongkum from Lukbaanyai gym was victorious on WBC Muay Thai super-welterweight ‘International Challenge’ fight at Lumpinee Boxing Stadium. 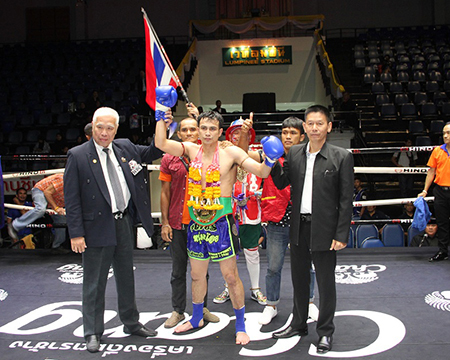 He defeated Chinese combatant Luajiah SathianMuayThai to claim the commemorative title belt. The main event featured the return of fans favorite Pompetch Sitnumnoi to the ring against Samoenai Phor. Angthong. Every round was close and have been scored for either fighter. Constant teep and side kick to Samoenai wore him out. Pompetch won tko in round 3. Here is the fight result in Suk Petch Numnoi + Street Fight. Fight no. 1: 108 lbs. Fight no. 3: 106 lbs. Fight no. 4: 107 lbs. Fight no. 5: 106 lbs. Fight no. 6: 107 lbs. Fight no. 8: 154 lbs. Fight no. 9: 108 lbs.